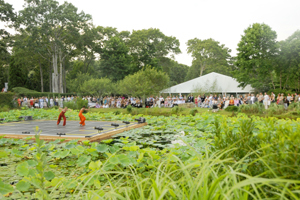 LongHouse Reserve will host its annual Summer Gala on its 16-acre East Hampton grounds on Saturday, July 18, 2009, honoring internationally-acclaimed silk weaver Carol Cassidy. More than 350 guests will gather to celebrate “ASIAN LAUGHTER,” a tribute to the joy that Southeast Asian art and culture bring to the world. Patrons will sample unique culinary delights from Thailand, Cambodia and Vietnam, while enjoying music performed on traditional Asian instruments. They also will have the opportunity to view LongHouse’s exquisite grounds and silently bid on art from renowned artists such as Willem de Kooning, Roy Lichtenstein and Dale Chihuly. Food will underscore the theme, as patrons gather under an Asian pavilion, designed by renowned outdoor furniture company GANDIA BLASCO, to experience Taste Caterers’ creative Asian fare. Laurent-Perrier Champagne will provide Brut L.P., a crisp, fresh and elegant Champagne, reflecting the fundamental essence of Laurent-Perrier Champagne. Suntory ZEN green tea liqueur and Bacardi spirits will delight the guests, who are encouraged to wear colorful dress, including silks, batik, and ikat. Vibrant lanterns and banners will celebrate the richness of cultures committed to the spirituality and meaning in art. Summer Gala proceeds will support the LongHouse Reserve’s mission to exemplify living with art in all forms – a mission Jack Lenor Larsen, one of the world’s foremost advocates of traditional and contemporary crafts, began in 1991. Through its arboretum, sculpture gardens, and educational programs, LongHouse unites art and nature, aesthetics and spirit. It remains strongly committed to a belief that the arts are central to living wholly and creatively. COMMITTEE: Edward Albee (Pulitzer Prize-Winning American Playwright), Eleanor Alper, Alice Bell, Madelaine Bennett, Dianne B and Lys Marigold, Judy and Ennius Bergsma, Abby Jane Brody, Adelaide De Menil and Edmund Carpenter, Anthony Coron, Charles Cowles, Gardner Cowles, Jan Cowles, Laurel and Theodore Cutler, Lisa de Kooning, Helen Drutt English and Peter Stern, Eileen and Richard Ekstract, Nina Gillman, Jane and Louis Gropp, Susan Gullia, Barbara Hoffman, Bruce Horten, Jane Johnson, Roseline Koener, Jack Lenor Larsen, Elizabeth Lear, Elizabeth and Mark Levine, Dorothy Lichtenstein, Hilda Longinotti, Jonathan McCann, Scott McDonald, Alexandra Munroe and Robert Rosenkranz, Stephanie Odegard, Nancy Olnick and Giorgio Spanu, Michele and Steven Pesner, Barbara and Michael Press, Edward Roberts and Elaine Krauss, Alan Rogers, Anne and Charles Roos, June Rosner and Russ Bilgore, Charles C. Savage, Barbara Slifka, Annaliese Soros, Joanna Steichen, Lenard and Fern Tessler, Edwina Von Gal, Robert Wilson, Jane and Michael Wind and Neda Young. ENTERTAINMENT: The Angkor Dance Troupe will perform interpretive dances, leading guests on a journey through ancient Cambodia. Internationally-acclaimed Korean drummer Vongku Park will combine poongmul and samulnori elements of traditional Korean dance with Western drama. AUCTION: Silently bid on art from renowned artists such as Willem de Kooning, Roy Lichtenstein and Dale Chihuly. Auction items can be viewed online prior to the event, at http://www.longhouse.org. Viewers can bid on certain items prior to the event. TICKETS: Individual Benefit Tickets: Starting at $500 for Strolling and tasting ticket, all evening, all delights. Carol Cassidy, who began her career as a United Nations weaving advisor, is today internationally recognized for her commitment to aiding people of developing nations. Although she has lived and worked with rural artisans in many parts of the world, she has most-notably worked with the people of Vientiane, Laos. She is credited with reviving the ancient craft of silk weaving in a place challenged by social unrest, economic hardship and war. Founding Lao Textiles in 1990 and turning the first profit in 1995, Cassidy has restored local pride in weaving and, in doing so, earned recognition for a small, remote land. More recently, she has traveled to Cambodia to lead a weaving workshop established to train amputees who are victims of the thousands of land mines that continue to plague the once war-torn land. Cassidy has given many physically challenged Cambodians long-term, gainful employment through her project, “Weaves of Cambodia,” making the beautifully colored silks produced particularly meaningful. Cassidy is an artist and a humanitarian. Her unique silks -- and her commitment to teaching the art form to others -- brighten the world. Through its gallery, arboretum, sculpture gardens and programs, LongHouse Reserve brings together art and nature, aesthetics and spirit, with a strong conviction that the arts are central to living wholly and creatively. LongHouse Reserve is a not-for-profit museum that encompasses nearly 16 beautiful acres in East Hampton, New York. Each year the LongHouse Reserve presents major exhibitions in both the pavilion and the gardens. Currently, there are more than 60 sculptures for the gardens including works of glass by Dale Chihuly, ceramics by Takaezu, and bronzes by Barcelo, Voulkos, Benglis and de Kooning. Works by Ossorio, Claus Bury, Yoko Ono, Opocensky, and Takashi Soga are also on view, while the installation of a Fly's Eye Dome designed by Buckminster Fuller and a site-specific Sol Lewitt add interesting scale and dimension.